CMIT staff responsible for delivering programs include: (from left) Marcus Kenter, program manager; Michelle Broselow, staff associate; Christie Davidson, program coordinator and chief of staff; Sharese Hurst, staff associate; Amanda Bilnoski, staff associate; and Dan Richard Beto, executive director. The Correctional Management Institute of Texas, which provides training and technical assistance to criminal justice agencies and organizations, was recognized as an Exemplary Program by the Texas Corrections Association. 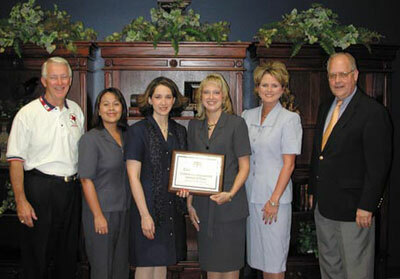 The award was given on June 29 during the TCA annual conference in Fort Worth. "The institute has had a positive impact on the corrections profession by delivering meaningful professional development training and by providing technical assistance," said TCA immediate past president Aris Johnson. CMIT, created in 1994, exists to develop and deliver a broad range of professional development programs and initiatives for personnel in adult and juvenile community and institutional corrections agencies. During 2002, CMIT, working with a number of agencies and organizations, produced 179 training programs that served 7,624 corrections practitioners and delivered 114,371 contact training hours. In addition to its training function, CMIT provides secretariat services for five professional organizations: the National Association of Probation Executives, Texas Probation Association, Texas Jail Association, Texas Association for Investigative Hypnosis and the Texas Association for Court Administration. "I am grateful to the Texas Corrections Association for this recognition," said CMIT executive director Dan Richard Beto while accepting the award. He added that the favorable reputation CMIT enjoys is due to the "dedicated and creative staff members who focus on delivering quality service; they are truly deserving of this recognition."